Sometimes the greatest ideas are the simplest and most obvious possible, but we miss them. 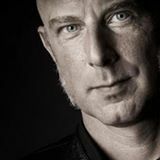 In an age where we look at developing technology, use computers, gps, drones, digital signals, Wi-Fi and whatever clever idea we come up with to solve our problems, we miss the simplicity of thought. Let me introduce you to Bodyflag and how we came across it. Sitting in a lecture at the start of the year and out of conversation a cohort (Oliver) brought up a product he produced, tested, deployed in the field and now sells. It was one of those moments where you stop, think of the sheer simplicity of the idea and then wonder why this is not part of the kit deployed by every crowd management supplier and emergency services at crowd events. We will, provide a detailed translation of the product (from the German using Google; so, we are sure there will be slip ups) after this simple introduction. Olivers idea, a telescopic flag that can be stored in a pouch and deployed to allow the member of staff to be found in a crowded environment. That simple, but why did we not all think about it. The BODYFLAG – a mobile telescopic pole with flag – is a perfect tool for security and rescue workers in action at a major event. The first-aid position marker is instantly visible from afar, helping the requested reinforcement to determine the exact location of a point of danger at a glance. The extendable flag clearly indicates the place of use and stands out even from large crowds. The BODYFLAG is easy to use. It consists of a light aluminum rod with a red flag. The telescopic pole is extendable to a length of 2 m – with a body height of 1.75 m, so just under 4 m total height can be achieved. Thus, a first responder marks his position at high altitude and is clearly visible even in a dense crowd. 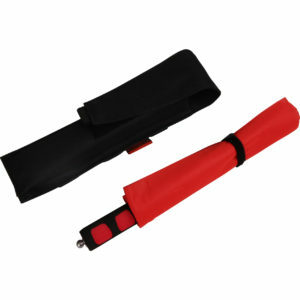 The BODYFLAG with red flag (40 cm x 60 cm) measures 28.5 cm (pushed together), included is a holster for practical attachment to the belt. The BODYFLAG can be purchased at allbuyone for a reasonable price and with fast shipping. 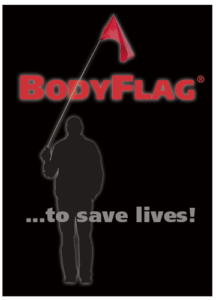 The BODYFLAG helps rescue teams to save valuable minutes in emergencies at major events. 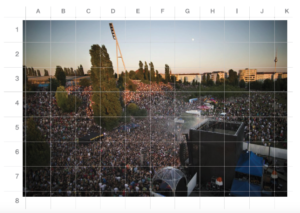 It clearly identifies the first responder of an emergency department and replaces the sometimes lengthy search for the exact position within a grid square on the venue. 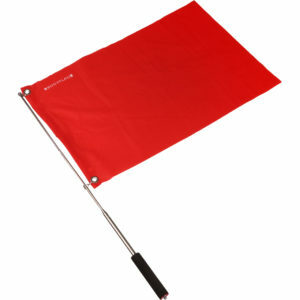 The extendable BODYFLAG with red flag has a telescopic pole that can be extended to a length of 2 meters. With an average first aid height of 1.75 m, a total height of just under 4 m is achieved to identify the site of use. On events with a lot of visitors many different organisations such as Police, Security Services, Paramedics and the Fire Departement are operating with mobile teams. These operational forces are usually coordinated by a control center. The control center as well as employees are using area maps with coordinate grids for a better orientation on the field. If an emergency situation occur in the crowd (injured, unconcious people etc.) while a mobile team is already involved on site which is in need of assistance this team would call for support via the control center. The control center will now initiate appropriade measures. In the following a further team will be coordinated and led to the position in crowd. This happens with the assistance of the coordinate grid. For example „Echo 5“ is according to the plan, the position that needs to be reached. Unfortunately is the grid not visible on the on the actual area on the field. This means, that the supporting team in the crowd can roughly guess in which part of the area they are located and in which part the team in need of help is located. It happens often, that the team that needs help is found to late or even not at all. This is a waste of crucial time and costs a human life in the worst case. In an emergency situation we call this a „collapsing time frame“! Based on experiences of the last years on major events such as Open Air Festivals and City Concerts it can be stated, that the „search time“ of the operational forces is way too long and it even takes up to 45 minutes to locate the people in need of help even though in some cases seconds count. As an example to strokes (19 seconds) or traumatic asphyxia (3 minutes). Even if the involved team calls for support immediately without beeing connected with the control center, there will be the same set of problems. The following graphic shows how difficult it is for the operational forces to orientate themselfes while beeing in the crowd. In every quadrant the are more than 100 people. The regular sight for humans located in the same high is however only 3 rows of people. In conclusion: The team in need of help could be 2 metres away and still could not be recognised by the supporting team! Buy the BODYFLAG in a practical holster bag that can be attached to the belt. So the flag is always ready to hand in an emergency. 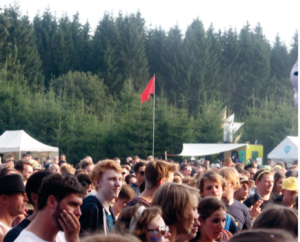 At events with many participants or visitors, such as at festivals, open airs, city runs, etc., different security and rescue teams are deployed in mobile teams. These teams are coordinated by a control center. For orientation on the event grounds, these teams often use maps with a coordinate grid, which is not drawn / marked on the real terrain. If emergency services require reinforcements due to an emergency, they usually request them by radio, via the head office and indicate their location according to the coordinate plan. However, the exact position can only be roughly estimated by all concerned. Due to the dense crowd of people, it is often difficult to find the exact emergency site for the subsequent support because the visibility for persons at the same height is sometimes only about three rows of people. This means that if a reinforcement team is only 3 m away from the emergency room, they often can not find it immediately. The “search time” eliminates valuable minutes, which in the worst case can cost lives (“collapsing time frame”). In some cases, however, a few minutes are critical, e.g. in a stroke (19 seconds). The BODYFLAG can provide a remedy: with a length of 2 m in extended condition, a total length of more than 4 meters can be achieved, depending on body size. The red flag is visible to the emergency services from afar, the emergency department quickly findable. For whom is the BODYFLAG suitable? City guide, hiking guide, pilgrim guide, tour guide, etc. re telescoping rod guides the supporting forces through the crowd. Why is the product the way it is? The BODYFLAG has been tested and modified over 1.5 years on major events. The present version is capable of continious running even under bad outdoor conditions. BODYFLAG can be sprayed with flourescent spray to cause light reflections. calculation of line of sight in crowds.